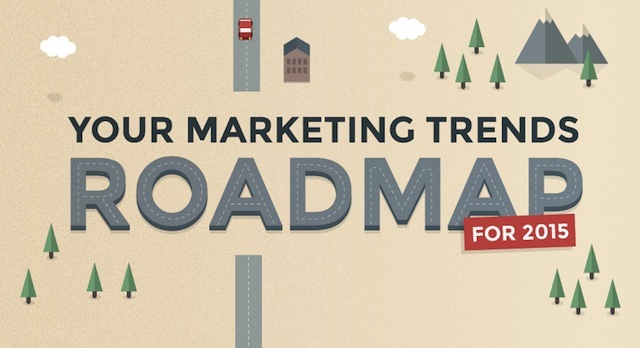 SocialTimes has pulled together statistics from 13 sources to create a fascinating infographic entitled Marketing Trends RoadMap for 2015. Ironically, while B2B organizations are waking up to the power of social media, that power is taking a sharp turn. Organic reach is the process whereby services and products are recommended by a purchaser to colleagues. Once called ‘word of mouth’, this form of social sharing dropped on Facebook from 12% in 2013 to 6% in 2014. SocialTimes pulled this fact from a study by advertising legend Ogilvy & Mather. The study, Facebook Zero: Considering Life After the Demise of Organic Reach, predicts that organic reach will drop to zero. Other pundits disagree or even claim that Facebook itself takes steps to insure that marketers will pay for reach. See John Loomer’s rebuttal Facebook Reach is Not Dead and Thomas Haynes’ assertion that Facebook Kills Off Organic Reach for 2015. Whether your marketing staff continues to seek organic reach, opts for paid social media, or pursues both, tracking the results of your strategy is critical. RightWave can provide accurate and detailed tracking in easy-to-interpret formats and the guidance to act on the results.